George Romero returns to his beloved franchise with LAND, and it's about time! At this point in time, the undead have taken over most of the world. Welcome back to Pennsylvania – Pittsburgh to be precise – where a last stand by the survivors is built and maintained by a group of rich businessmen. In a class society which unfairly distinguishes the very rich from the very poor, ruler Paul Kaufman (played by Dennis Hopper) lives in a beautiful skyscraper while the rest of the society does his dirty work and lives in squalor. The city is enclosed by an electrical fence, so the zombies can’t get in, but to safely roam the streets outside of the city, Riley Denbo (Simon Baker) has designed a war machine called Dead Reckoning. Riley works with a man affectionately known as Cholo (John Leguizamo), and together they use Dead Reckoning to bring back medical supplies and food for the people of the city. All the while, Kaufman shouts demands safely in his luxurious home. The point is made very clear. The rich run the world and the working class man suffers for it. 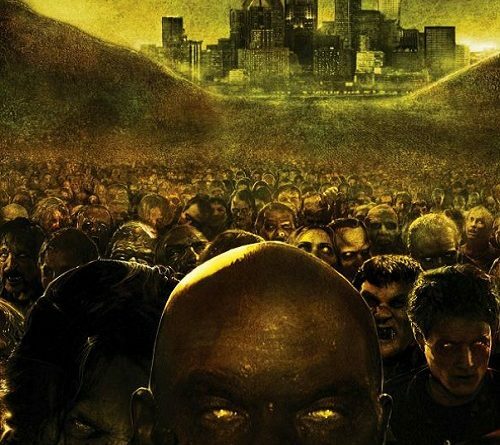 The real distinction between Land of the Dead and previous films in the franchise is that the zombies have become much smarter, and it’s not just one of them – it’s all of them. 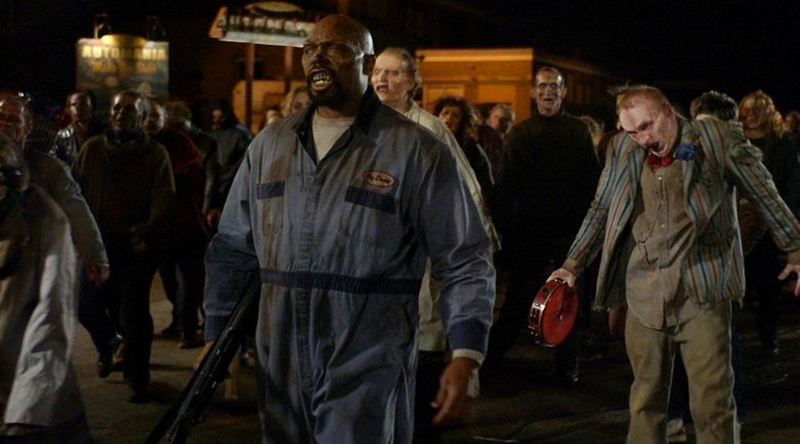 Sure, Bub had some level of intelligence in Day of the Dead, but he didn’t lead an uprising against the living like Big Daddy (Eugene Clark), a gas station owner in his life before zombification. The creature leads an assault on Kaufman’s society, aiming to wreak havoc on the living. There are a bunch of pretty big names in this feature, which is also a distinction between this and the previous entries. Also included in the casting is Asia Argento, Dario Argento’s daughter. This is not some small indie horror flick; Land of the Dead is a big-budget, post-apocalyptic piece of epic horror, with an estimated budget of $18m. Additionally, it is the first film directed by Romero that was released MPAA certification, with an unrated version that became available once the movie was out of theaters and on home video. It’s pretty scary at times, and it’s also very gory. But I think the aspect of the film that has become very divisive among fans is the use of blatant CGI at times, making it very easy for the viewer to be taken out of the fantasy. It’s not just that it’s a little snippet of CGI that you can barely notice. It’s very obvious and not very well-done CGI, contrasting with the superb practical effects also found in the movie done by Greg Nicotero and Howard Berger. The story is great, and so is the execution (besides those damn CGI missteps), making it a great inclusion to the franchise. But if I’m going to be honest – I can’t believe I’m saying this, but I really am about to – the remake of Dawn of the Dead that came before it may be an overall better film. Snyder’s remake was convincing and absolutely terrifying, whereas Land is simply another solid entry in the franchise. Sorry, folks. Regardless, Land is a good movie, worth watching for Leguizamo’s performance and Big Daddy’s inclusion, among many other reasons. The Franchise Files will continue with Diary of the Dead, which is a very different movie than what we’ve seen in the franchise thus far. Stay tuned.